Trichy: In an unfortunate incident of a fire breaking out at a Delhi based hotel has claimed 17 lives. One of the deceased in the fire accident was a 55-year old Trichy dentist who was in the town for an official meeting regarding a freeze-dried plasma project. The incident took place two days ago in 4 storey building at Arpit Palace hotel in Karol Bagh. The fire cracked on the second floor of the building in the early hours of the day. A short circuit is suspected to be the cause of the fire that broke out in the early hours today, a senior civic official informed PTI. One of the deceased has been identified as Dr S Sankaranarayanan, a dental surgeon who had been running a dental clinic for about 20 years besides offering consultation at a leading hospital in Trichy. He was in Delhi for a meeting with Drug Controller General of India (DCGI) to discuss on freeze dried plasma project. The death news of the dentist came out when one of his colleagues tried to contact him but found his phone unreachable. He immediately contacted the hotel authorities when it was informed that the dentist was one of those who died in the incident. The police official further shared the pictures with his family members for the identification. The family then reached the city to receive the dead body. 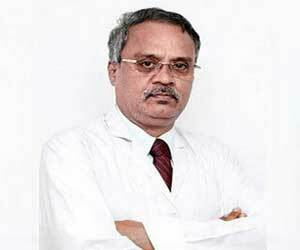 Dr. Sankaranarayanan had been a Director of Mothercell Regenerative Centre Pvt Ltd. He was into stem cell research since 2012 in Trichy. The company had patented the product. The dentist and his colleague presented a proposal on freeze dried plasma to the Defence Minister Nirmala Sitharaman during her visit to Trichy in March last year. They said dried plasma (or powdered plasma) would help arrest blood loss of injured soldiers in battlefields. The clinical trial on the project is pending, reports TOI. Unfortunate we lost him with his research works. May his soul rest in peace.